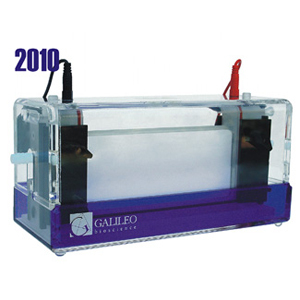 The Galileo Bioscience Reflection 2010 is a wide, high capacity gel electrophoresis separation system that allows users to run up to two protein gels simultaneously on a 20 cm wide x 10 cm tall format. The large gel format makes this unit ideal for users who have a large number of protein samples to run simultaneously. Galileo's unique casting base allows users to both cast and run gels without ever having to unclamp the upper buffer chamber. This makes handling gels safer and more convenient, especially for those who may be prone to ripping their gels between the two activities. The 2010 vertical gel box also includes a water cooling feature for electrophoresis protocols that require lower temperature. This water can be provided by the tap or other temperature controlled source and is easily connected by attaching standard tubing over the 3/8" barbed in/out ports on the device. Users may also facilitate cooling efficiency and uniformity using Galileo's optional alumina backer plates (see accessories below). Alumina cooling plate for use with cooling systems. This plate can be sandwiched between the gel and the inner buffer chamber to improve overall temperature uniformity. Casting base for quick, efficient and leak-proof gel casting.